Just got back from an epic trip to France. Check out the Trip. 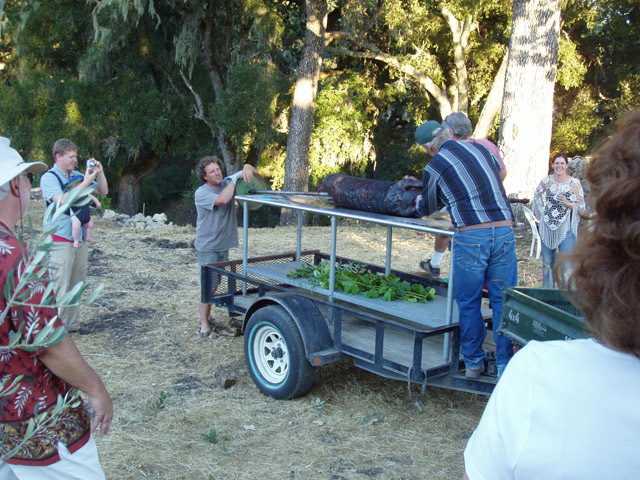 August 20, Tablas Creek Vineyards hosted their second annual pig roast. We attended the first event and had such a great time that we had to make it again. This year, Tablas Creek has entered into a partnership with Windrose Farm. Windrose will have an on-site farmstand and will be using some of the Tablas nursery area for growing and propogating their organic produce. 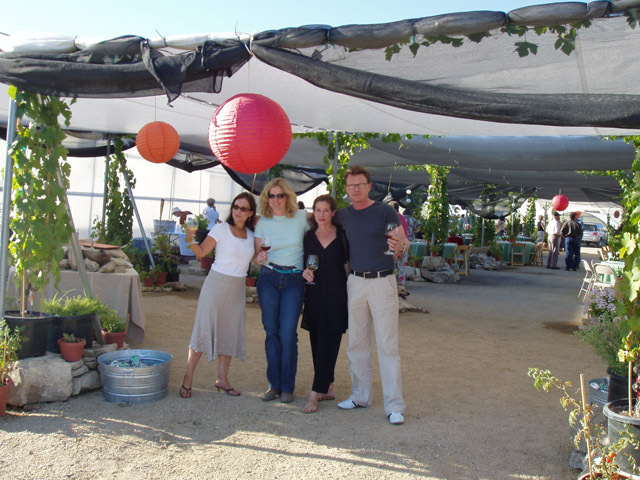 So the event featured Tablas Creek wines and Windrose Farm organic produce. Being two of our favorite farming families we were excited to attend. Our friends Angela, Simon, and Wendy drove up and stayed with us so they could attend also. 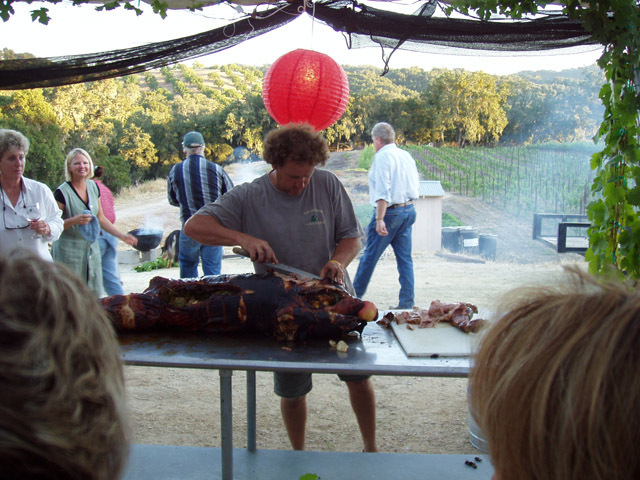 While Tablas Creek served their excellent 2004 Rose, a re-release of the 2000 Clos Blanc, and the 2003 Syrah, the star of the show had to be the roasted pig main course. 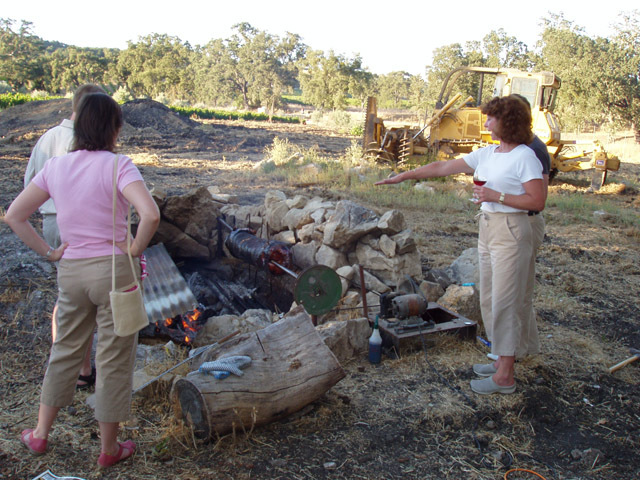 Neil Collins, the winemaker, got up at 3 am in order to light the fire in the pig pit. 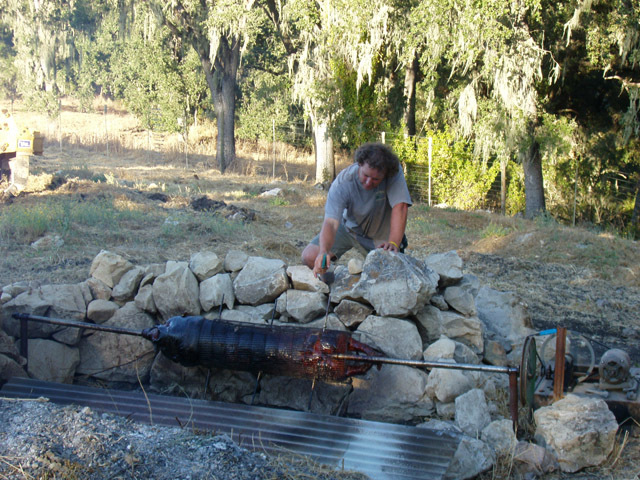 The pig was set on the coals at 6 am and had been rolling over the fire all day. Of course it required occasaional basting by squirt bottle. The pig is loaded up on the back of a trailer to drive up to the dinner area while Jason Haas with his son in tow watch on. Then Neil turned from winemaker into butcher to serve the hungry mob. We could go on and on about the wonderful barbequed beans and eggplant from Windrose, how well the Rose tasted in the afternoon sun, about the tasty sausages, bread, cheeses, and fruits. But you really had to be there. As we walked back to the car with the full moon rising over the vineyard, we knew we will certainly be back. Copyright 2008 Digital Beach. All Rights Reserved.